Amenities: 24-hour security, entertainment room, pool, spa, hot tub, gym, and barbecue. Other: The bedrooms in the Renaissance condominiums are generally larger in size than most buildings downtown, even for a unit with the same square footage. 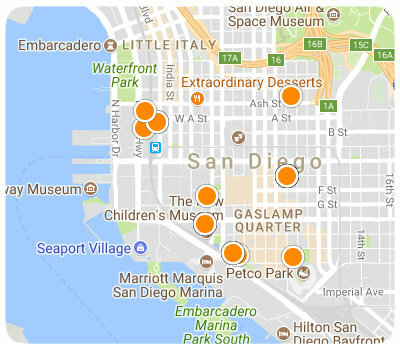 The Renaissance condos are the most centrally located, right across the street from a major grocery store (open 24hrs), the large shopping mall, just a few blocks to the Gaslamp to the east and a few blocks to the bay going west. West facing condos, which have the best water views, do not have balconies, except for the top couple of floors. West: This view from the Renaissance condos is the most valuable view in the complex. Going West for several blocks almost all the way to the bay are only mid rise building, about 6 stories or less. So in 2013 you have great bay views this direction. Be cautious in purchasing a bay view because there is a lot of future construction planned along the Western waterfront that may obstruct some of these views in the future. Ask me for more details. Also note that only the condos on the top few floors have balconies on the West side of the building. North: For the North view from the Renaissance condos its better to be in the North tower than the South tower. The North tower looks out toward the business district so it’s a skyline view, which is better at night than the day. The South towers North view is obstructed by the North tower, unless you are in a NW corner unit, as they two towers are off set a little. East: This is the least obstructed of the views, there are no other high rises for about 6 blocks over. You can see all the way to the eastern mountains and can watch the plans fly in. Renaissance condos facing East feel very private. South: The South view has some great view corridors between the Horizons twin tower condos and the proposed high rise condo to go on the parking lot you now see to the South. This view is very obstructed by the Horizons condos. Like the most: Residents in the Renaissance condos have conveyed to me that they really love the location. This is probably the most centrally located property downtown, a fine balance between the harbor and shopping, and across the street from Ralph's grocery store. Residents also boasted about the floor plans, simple and flowing. Compliments also given to the architecture of the building and the quality especially the kitchens. Like the least: Several complained about the poor lobby design and lack of guest parking. Lack of a freight elevator. Potential loss of views from new construction. Other comments: The Renaissance condo building has a cantilever design and gets wider the higher up you go. Each time a unit is sold in this building a tax of 1.0% has to be paid to the Center City Development Corporation. Usually the sellers ask that the buyer pay this unusual tax, but it?s negotiable.